As a pop star, Jason Donovan had two big problems. The first was his singing, which we’ll get to, but the second was that Stock Aitken And Waterman didn’t seem to have much idea what to do with him. Kylie couldn’t sing terribly well either, but she immediately turned out to be a missing piece in the PWL puzzle: a girl who could be ordinary without being boring. It helped that she’d had a few years experience as an actress doing exactly that, too. Couldn’t Jason do the same? Maybe: PWL had gone down that route a little with Rick Astley, but his appeal was more the Clark Kent demeanour and Superman voice, and Jason had, so to speak, no vocal spandex in his closet. 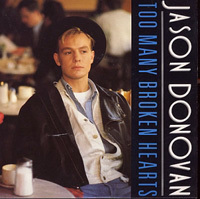 That comically awkward bit of guitar at the start of “Too Many Broken Hearts” sounds like a gesture to the idea that Jason, being a boy, might have some connection to Boy Music, but it’s a complete bluff: this is business very much as usual. “Too Many Broken Hearts” seems like SAW taking the path of least resistance, giving Jason some solid material and hoping he doesn’t make too much of a bish of it. As an insurance policy he’s mixed down in the big earworm chorus and the “backing” vocalists track his vocal line to the note. He gets the verses to himself though, giving us plenty of opportunity to appreciate his trundling delivery, tiny range and the strain every time he has to do anything dynamic. The overall vibe is one of karaoke – not in the usual critical sense of someone doing a crap cover, but the unpleasant sensation you get when you’re singing karaoke and realise you’re only actually comfortable on the choruses: the verses become tightropes of potential embarrassment. In this context the pre-chorus climax – “I’ll be HURT I’ll be HURT” – is a triumph, not just because Jason actually nails it but because there’s a huge sense of relief every time he gets there. A friend gave me the Jason Donovan board game as a ‘joke’ birthday present one year. I’ve still got it. It’s not very entertaining. Nor were many of his records. His best record by far. Not saying much, but it’s head and shoulders above all the other dreck that was released. I couldn’t believe that previous debut single “Nothing Can Divide Us” actually became a hit. Indeed, SAW’s output in 1989 was so bad, that this along with Donna Summer and Sonia was actually one of the best offerings, before they would hit a nadir with their band of 3 Jason clones Big Fun. As for his singing, it was hilarious when he had his much touted singing lessons for Joseph and the Amazing Technicolor Dreamcoat and still sounded the same. #62 – I agree, “Nothing Can Divide Us” was dire. The record itself sounded like little more than a rough demo, and from memory (I’m at work, so can’t easily check through YouTube) the video was little more than Jason singing with a sickly grin around his chops while some lights flashed in the background. Not only was I surprised it was a hit, it also looked as if nobody really wanted it to be one. Did the single come with a free poster or something? I realise that’s a bit of a cliched argument, but I really can’t think of any other explanation for its success. Dorothy’s definitive version was number 40 on the Top 40 this week 40 years ago. Apart from the nice round numbers, I had to post this somewhere. It’s truly astonishing! #65: And here are my meditations on the same record – and yes, this is going to be in the book. Enjoyed that Marcello, thanks. Looking forward to the book. And Witchita – not sure ‘enjoyed’ is the word for the You Tube clip. But it’s certainly unforgettable. I was then told that was Dorothy Squires, who’s not a patch on Shirley Bassey. I even remember Mum uttering her name with suppressed venom, like she had been forced to remember an unpleasant memory. I never did find out what her actual beef with her was, even when the occasional “I can’t stand that woman” was heard when she appeared on the telly or on the radio. So I never sought to look into Dorothy’s history or back catalogue. Looking at Wichita’s link, I’m not overly enamoured with her performance. Uncomfortable to watch and listen. However, having read Marcello’s piece, I can fully understand why her fans love her so much. Emotionally naked and unapologetic, she must have been the inspiration for a thousand drag acts (not least, Danny La Rue). And dubbed a “vexatious litigant” by the High Court for her regular legal actions. Jason Donovan was the subject of a particularly good edition of “Who Do You Think You Are?” last night – his mother was descended on her mother’s side from a popular soprano who worked with the Australian equivalent of Cameron Mackintosh circa 1900, and further back from a Port Arthur convict; and on her father’s side from Captain William Cox, a soldier who settled in the penal colony around 1800 and went on to build the first road from Sydney across the Blue Mountains, a vitally important link for the new colony. Why nobody checked his album from Polydor? Donovan admitted himself that his songs (PWL, not Polydor), are like sausage and mash (maybe means nothing special?). If you criticize his songs from Polydor (written by Nik Kershaw, Martin Page and so on), then you will do justice to his singing styles. Can’t speak for anyone else, but I LOVE sausage and mash. Can you give any comment about any song from 3rd album? All Around the world and Oxygen by Nik Kershaw, or Give a Good Heart by Martin Page? I don’t like his 1st and 2nd album and singles except some of them, especially the cover version like I’m Doing Fine, Rhythm of The Rain, I think he did fine with that versions. I mean sausage and mash are cheap. So Jason referred to cheap songs maybe?